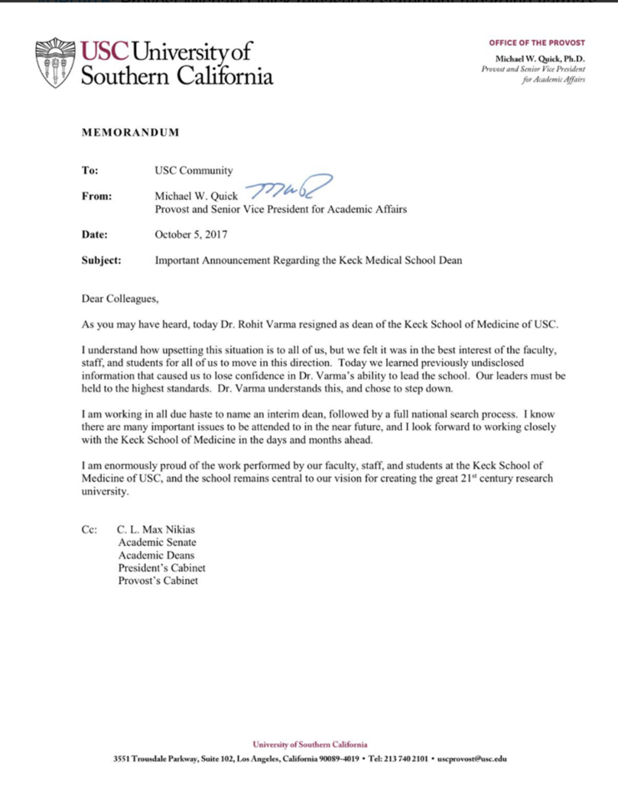 Dr. Rohit Varma, the USC medical school dean, resigned Thursday after sexual harassment allegations from 2003 resurfaced. The university cited “previous undisclosed information brought to the university in recent days" from the LA Times and the “university's own inquiry" as the reason for Varma stepping down. According to the LA Times, the female researcher who accused Varma of unwanted sexual advances reported him to the university. The university dealt with the allegation promptly when it occurred by depleting Varma's salary by $30,000 (though his salary returned to the full $280,000 in 2004). The administration also ordered him to undergo counseling. As for the female researcher, the allegation was settled with a $135,000 check from the university. Although Varma was temporarily blocked from being a “full member of the faculty," he became a professor not long after and continued to move up in the ranks. Varma was hired as the dean of the USC Keck School of Medicine after the previous dean, Dr. Carmen Pufilato, was infamously fired for using meth and other drugs with prostitutes and criminals. It's unclear why USC continues to hire medical school deans with sketchy backgrounds. Hopefully, the next dean will be drug-free and respect women.